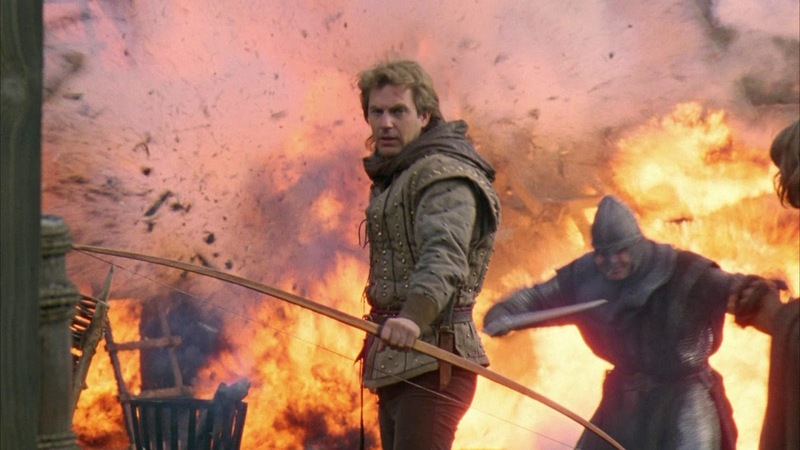 Another retelling of the legend, Robin Hood: Prince Of Thieves rides the charisma of star Kevin Costner but is an otherwise overlong and unnecessary rehash of a familiar story. Robin Of Locksley (Costner) is part of King Richard The Lionheart's latest Crusade. Things are not going well and Robin is imprisoned in Jerusalem. He makes his escape along with a Moor named Azeem (Morgan Freeman). As Robin sails back to England, the evil Sheriff of Nottingham (Alan Rickman) assisted by his cousin Guy of Gisborne (Michael Wincott) and the evil witch Mortianna (Geraldine McEwan) takes advantage of the vacuum created by the King's absence to make a grab for power. Robin's father Lord Locksley (Brian Blessed) refuses to join the Sheriff and is killed. Robin and Azeem arrive in England to find the Locksley estate destroyed. Robin connects with his childhood friend Marian Dubois (Mary Elizabeth Mastrantonio), a cousin of the King, but she is playing a cagey game of staying on good terms with the Sheriff to protect her estate. The Sheriff identifies Robin as a threat to his plans, prompting Robin and Azeem to escape into Sherwood Forest where they join forces with a band of farmers and misfits hiding from the Sheriff's brutality and high taxes. Robin organizes the group, which includes Little John (Nick Brimble), Will Scarlet (Christian Slater) and eventually Friar Tuck (Mike McShane), into a band of thieves, and they start to gather wealth by hijacking gold shipments while Robin plots a course to stop the Sheriff and avenge his father. Directed by Kevin Reynolds, Robin Hood: Prince Of Thieves is an amiable enough romp through the legend. The film ticks all the boxes from action to romance, but cannot avoid a sense of paint by numbers, an assembly of elements lacking a soul. The settings are grand, the early scenes in Jerusalem are welcome, and when the swords clash and the arrows fly, the battles scenes achieve the requisite level of excitement and drama. commentary about social justice, dabbling with tension among the ranks of the thieves, sprinkling some supernatural dust, deploying the requisite swashbuckling, playing with the theme of avenge thy father, and injecting romance here and there. It sometimes works in individual patches, but Reynolds is never able to create a unifying theme, and the severely bloated running time of 155 minutes does not help. Star Kevin Costner coasts through the film with a "look how handsome I am!" posture, not really even trying to do much more than wow the camera with star power. Morgan Freeman is much better, and appears to be the only member of the cast with the necessary solemnity matched with wit to rise above the silliness. The bad guys lack venom and undermine the more dramatic aspects of the movie. Alan Rickman is mostly goofy as the Sheriff, and Michael Wincott is wasted as a less than fearsome Guy of Gisborne. 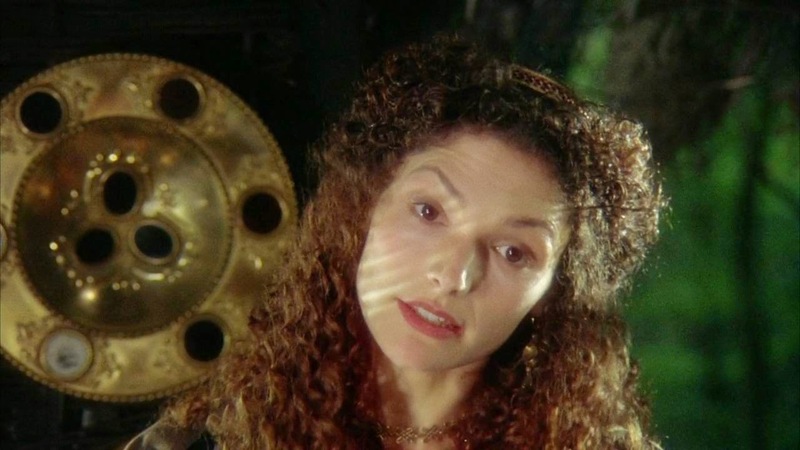 Mary Elizabeth Mastrantonio tries hard but is never quite able to generate the required passion. The film bursts into life in the final 30 minutes and offers a rollicking climax, the people rising up to bring down the Sheriff and his cronies as Robin claims his love and saves the day. The pivotal sword battle between Robin and the Sheriff raises an enjoyable bit of sweat. But when the dust settles and Sean Connery strides in for his cameo and Bryan Adams sings his smash hit "(Everything I Do) I Do It for You", it becomes apparent that Connery in two minutes is better than Costner in two hours, the song is better than the romance, and this version of Robin Hood recycles that which need not be recycled.